These paper bead earrings are beautiful. They are quite stylish, and you would never guess that they are made out of paper. Make some for yourself and your friends as gifts. While you are at it, make some necklaces and bracelets to match. The possibilities are endless. 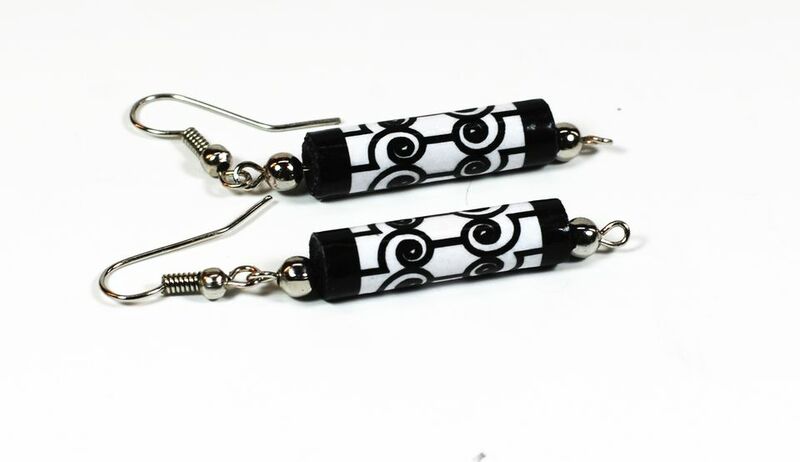 You can choose to make your own designs for your paper bead earrings or you can download a PDF template of several black and white paper bead earring prints. Draw a box 1" x 10 3/4 inch on a piece of paper. Draw your design with permanent ink markers or pens on the left end approximately two inches long. You don't need more than that because the design will not be visible when the paper bead tube is rolled. Download the PDF template files here. Print the templates on a sheet of ordinary copy paper with a laser printer. Using a ruler and craft knife, cut two paper earring rectangles of the earring design of choice. Roll the paper bead rectangle around a toothpick to form a paper bead tube. Use a glue stick to secure the end of the paper rectangle to the end of the paper bead tube. Paint both ends of the paper bead tubes black using the permanent ink marker. The next step is crucial. This paper bead method was discovered by Lisa (Beyondbracelets YouTube Channel). Lisa makes paper bead jewelry for a living and has spent a lot of time researching products. She has found PC-Petrifier wood hardener to be the best product for paper beadwork. It hardens the paper bead plus adds a glossy shine. Lisa has an awesome YouTube video tutorial that teaches how to use the product. Please watch it to see how Lisa dips the beads and dries them. Lisa recommends stringing the beads with fishing line, before dipping them in the product. We used floral wire. It is up to you to decide which method works best for you. After dipping the beads in the wood hardener five times, hang the beads and let them dry. It doesn't take long. They should be dry to the touch after about an hour. The beads need about 24 hours to cure. The beads are glossy just from the PC-Petrifier, but to add extra protection it is recommended that you dip the beads in waterproof polyurethane and let dry. Add a silver bead to the 2-inch eye pin. Place a paper bead on top of the silver bead. Place another silver bead onto the eye pin over the paper bead tube. Cut the eye pin with a wire cutter so that approximately 1/4 inch wire is showing on the top. Using the round needle nose pliers, form the top wire end into a loop. Attach a fishhook ear wire to the loop. Your earring is finished and ready to wear. There are seven different earring design templates for download. The above photo depicts three of the designs.